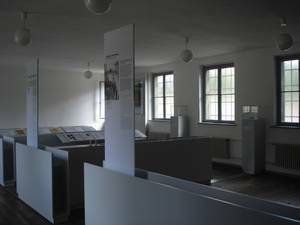 The permanent exhibition in the former camp prison informs the visitor about the history and function of the building which prisoners called the “Bunker”, a central location of terror in the concentration camp. Prisoners from the Ravensbrück Women and Men’s Concentration camps as well as from the “Youth Protection Camp Uckermark” (called so euphemistically by the National Socialists) served sentences in the cell building. Corporal punishment was used on the prisoners from the women’s camp. As of February 1944, the building was also used to imprison prominent prisoners awaiting trial, among them Helmuth James Graf von Moltke, Nikolaus Groß, the unionist who was beatified in 2001 and Nina Schenk Gräfin von Stauffenberg, the wife of Hitler’s would-be assassin. The men and women who were imprisoned in the cell building are presented by a series of short portraits. Their statements document many perspectives of the daily life for those imprisoned and the experiences of the “Bunker Imprisonment” (“Bunkerhaft”). Furthermore, the exhibition details the time after 1945: After the temporary usage by the Soviet army, the first camp museum of the National Ravensbrück Memorial with national memorial rooms and reconstructed detainment cells was created in this building in 1959. The design is kept intact but is now supplemented with information about how it originated.